The Flow Fund Circle chooses visionaries, most of whom have never given money away before, to disperse funds for three to five years in an intuitive and heartfelt way. We focus equally on the process of giving and its effect on each flowfunder and recipient. We consider flowfunding a healing-arts form of giving. A Flow Fund Meeting with Marion Weber in the center. Flow funding is a healing-arts form of philanthropy which honors spontaneity and creativity. It is free from the traditional, more linear type of philanthropic guidelines and is based on trust. It has a transformative and empowering effect on each flowfunder. I choose visionaries to give away $60,000 over a three or five-year period. These visionaries are called flowfunders. Nobody knows that a flowfunder is caring money. Therefore flowfunders have the creative freedom to notice what really resonates with their heart. They give support spontaneously and intuitively in a meaningful way. I consider them all healing artists of generosity. 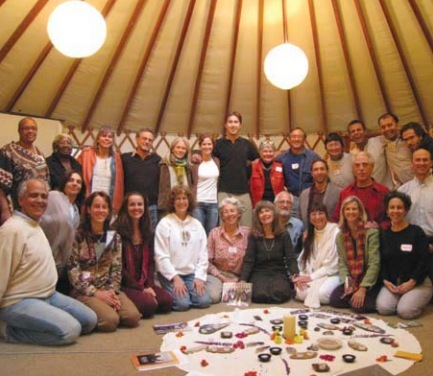 I came up with the idea for the Flow Fund Circle 25 years ago after taking a vacation from my philanthropy for a year. It became very clear that I did not want to return to the constricted form of philanthropy I had been practicing. While making out my will it came to me that it would be fun to give gifts of money to friends, who I had supported previously, to give away. This seemed so exciting that I couldn’t wait for me to die in order to do this! Everybody told me that they would be thrilled to give money away! And so flowfunds immediately began to go out all over the world in ways that I could NEVER have imagined!!! And from that moment on funding became for me a creative outlet instead of a duty. Have you ever been met with resistance when using Flow Funding? What specifically were the concerns, and how did you respond? – What moved or touched you? The interviewer asked me if sometimes the surprises were difficult. I responded by saying that the surprises were perhaps the most energizing for me. They allowed creative insights to rise up from the group and helped shift our understanding of what we were doing collectively to a new level. I learned early on that it has to be the right moment in a person’s life to be a flowfunder. If a person is still struggling to live sustainably, it is too hard to be given money to give away at a time when they are needing to find their own money to live on. I think that if traditional foundations and philanthropists try introducing flowfunding in a small way, perhaps by giving their staff money to give away, they might find that burn out will diminish and the old patterns of funding will soften, with new potentials rising spontaneously and in a refreshing way. I learned that when the process of giving was shared, I felt more relaxed and had more fun. Therefore the walls that sometimes had been built around my wealth by me and others began to recede. Money began to flow in a natural and healing way from me to the flowfunders out in the world. We all long to feel connected and free from isolation and to feel the flow of our generosity deeply. Creating a flow fund circle will give you the space to do this. Why does Flow Funding matter to you? For me, flow funding ended the constrictions of duty, alienation and burn out, and let in the fresh air of discovery, adventure, warmth, mystery and friendship. This form of philanthropy is extremely effective because it is based on trust and the wisdom of our circles of participants. Our outreach and discoveries are all transparent and shared. When I review our website, I am constantly amazed at where the money has gone and the hundreds of hands through which it has traveled.